Escape-the-room games have a rather insidious premise—it really shouldn't be fun to be locked up and needing to deconstruct enigmatic codes and quirky contraptions just to be on your merry way. 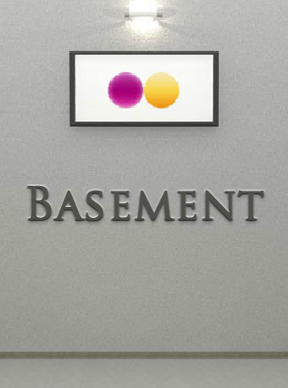 Of all the places to be trapped, though, a basement seems to be the most fitting, and if you happen to find yourself kidnapped and thrown into Nekonote's Basement, you'll be happy to note there are no dark shadows, old skeletons, dusty spiderwebs or monster-mouthed fiery furnaces to scare you. Instead, albeit grey-walled, it's smattered with rainbow colors, soft white lights and clean lines. The only menace are a few cleverly-construed puzzles to occupy your cranial parts while those thick cold bars mockingly block the exit. So it turns out, it's rather fun to click about, looking for signs of anything that will bring you closer to the key to freedom, and the puzzles are the perfect mid-range of challenge. Pay careful attention to visual clues while you explore and it won't be long before you uncover the exit key. Basement shows that Nekonote has some happy tricks up the sleeve and may leave you wondering if we'll get to explore the rest of house someday. 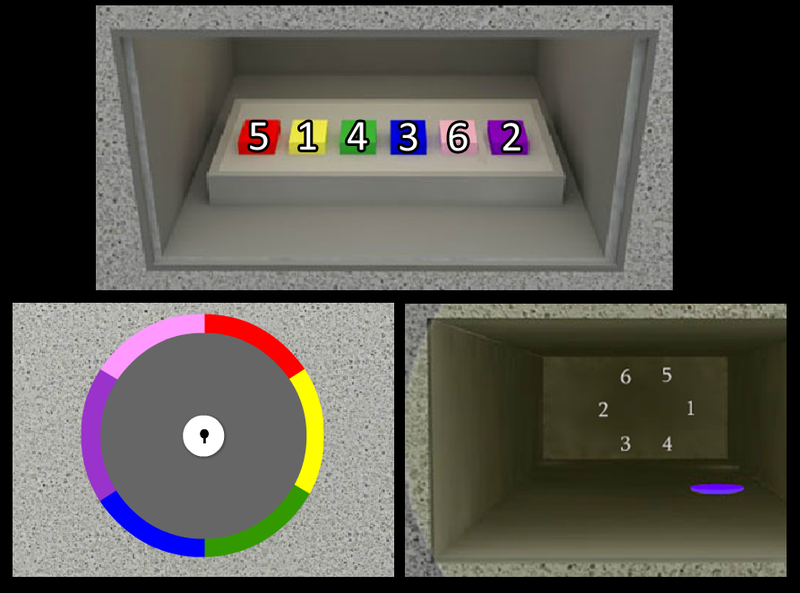 You begin facing a barred doorway; there is a color wheel with a keyhole on the right and, on the left, a drawer with four arrow buttons. Make a note of the position of the colors on the wheel. Push the button and the lights dim. Back up and take a look around the darkened room. Turn right from the doorway and you'll see glowing arrows on the wall underneath the picture. Turn left to return to the barred doorway, zoom in on the bottom of the bars, and push the button to turn the lights back on. Use the clue you just saw to remove the picture. There's something in the back, but it's too dark to see it. It looks like a piece of paper, but it's too hard to reach it. Back up and turn right; here you'll see three colored panels in the wall, a number pad, and a desk. Zoom in on the desk. Get a SQUARE WITH CIRCLE CUT-OUTS from inside the left drawer. Here's picture of a butterfly and flower (a clue). Make a note of what you see. Click the arrow to back up from the desk. A STICK WITH GRABBY HAND. Click on the end of the stick to expand it. There's also something high up near the ceiling, between the two lights. Click there to look a little closer. Use the EXTENDED STICK to reach a piece of paper down in the floor slot. Turn right. Examine the drawer to the left of the doorway. Turn left to the desk area again. Now you can use the knob to open the right drawer. Examining the drawer knob, you'll see it has several dowel rods on the back. There is also an arrow next to one of the rods. Line up the butterfly to where the arrow is on the back of the knob. 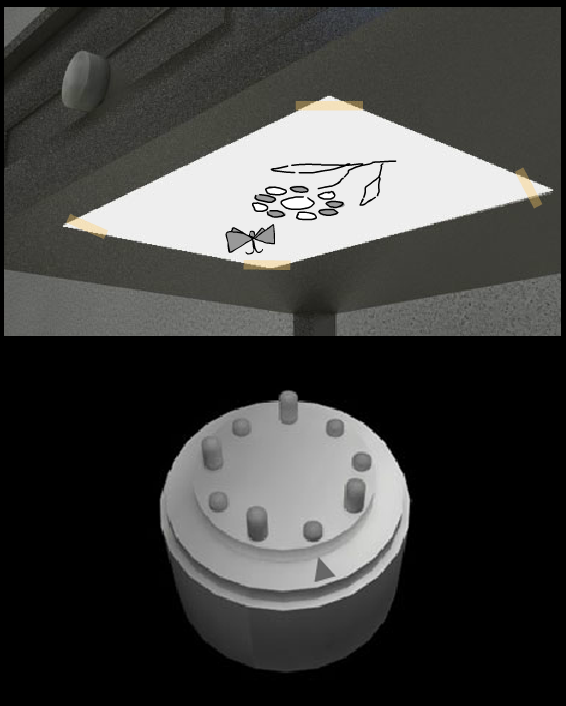 Push down the rods that correspond to the dark grey flower petals. Now you can insert the KNOB into the right drawer. Get the RED CIRCLE KEY. Back up then turn left. Zoom in on the hole above the fallen picture. And make a note of the circle of numbers in the back. Back up, turn left, and examine the blue (middle) panel above the desk. Use the BLUE SQUARE KEY to open it. When you've pushed all the buttons in the proper sequence, a box lowers from the ceiling in the scene to the right. Click enter and, if you used the correct code, it will read "OPEN." Back up. A YELLOW DOT. Take it. 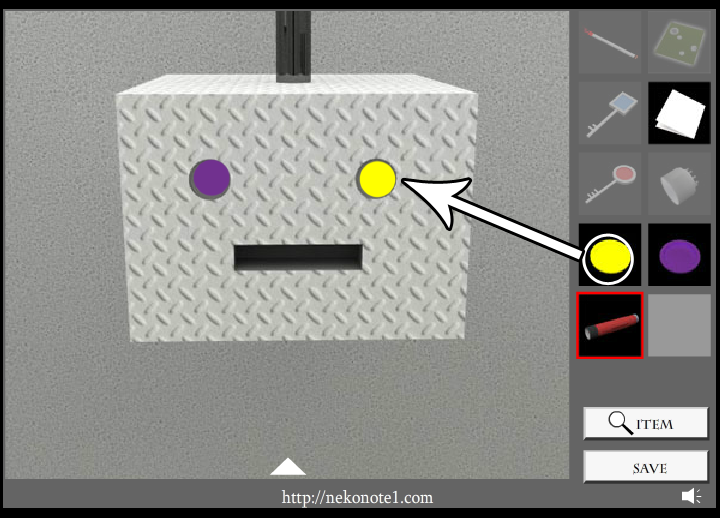 Place each dot in the box "eyes" according to the fallen picture: yellow on right, purple on left. a RAINBOW KEY will drop into the box "mouth". Take it. Use the RAINBOW KEY on the keyhole of the color wheel. This will cause the bars to raise up, opening the doorway. You can now climb the stairs and escape the basement! Fun little escape. A little pixel hunting, but a good distraction for 10 minutes. But I didn't see anywhere else to use them. I think the reason those two items weren't greyed out is because their use isn't limited to one time. Theoretically someone might need to keep going back to use the flashlight and look in the hole, or maybe look at the piece of paper again for the clue if they didn't catch it the first time. It's probably easier to code a key or similar item to grey out after performing a function with it. A solid puzzle overall. I like the way the color wheel is in view the entire game, teasing me as I search for the color sequence I know must go with it. I managed to get the sequence right at the end despite being colorblind, so that's a plus too. The knob puzzle confused me. There was no feedback to tell me I was ready to put the knob in and I sat there staring at it in my inventory, expecting some sort of light to turn on or secret panel to open up to tell me I'd done that bit right. The way you're free to look around more before leaving was sort of anticlimactic, because I'm pretty darn sure there was no second ending. I've never gotten the point of wobbly pictures frames to be honest. Clicking on the edge of an object that already has two button-shaped objects in the center feels like a needlessly explanation-worthy way to enter a password. The first time I encountered a wobbly picture puzzle I was stumped until I read the walkthrough, and I have yet to see a puzzle that hints at the fact that the corners or edges of a painting are at all significant. It's one of those things you have to have played a few escapes to know to look for, as opposed to something someone might guess right off the bat. The Crimson Room might not have been the most polished escape, it being a fairly new genre at the time, but every puzzle in it at least felt like something you might actually try if you were there in person. Paris weather report : freezing BUT sunny ! Yeah, I clicked under the desk, too, and apparently didn't find the magic spot. And I got tricked by the directional clue. I was trying to order them by size. Nice little escape game. Very enjoyable and logical. With the exception of the slight pixel hunting it was pretty cool. Kinda like Tesshi-e lite. Kinda. get the paper with the grabby hand.